At the moment the weather appears to be overcast for our scheduled time to shoot, with rain starting again around the time we would finish. So we are going to go for it. We will squad at about 9:15, and try our best to get firing started by 10:00 AM. The weather starts getting dicey at about noon. With the eTargets there should be plenty of time to complete our 2x600. Bring your rain gear, but hopefully you won't need it. 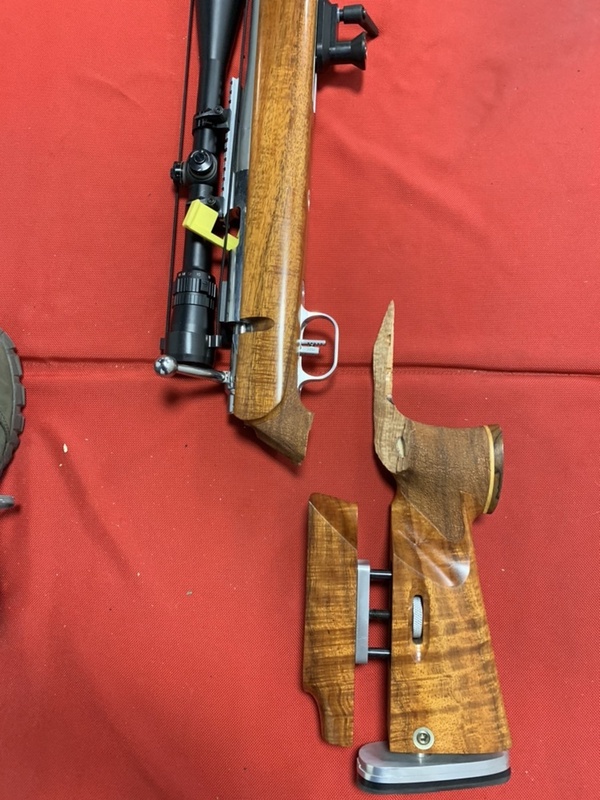 We had one each F-Open and F-TR, so those shooters are the high in their category: F-Open - Tony Dekeliata with a 386-10X, F-TR - Charley Hayes with a 374-8X. In the sling category (Target Rifle) we had two Luddites (using metallic sighted Palma Rifles). Ray Gross was high with points with a 397-17X, and Leo Cebula with high with "X's" with a 396-18X. I guess you could argue that everybody won today. We finally reached the end of the 2018-2019 Snow Country English Match Series. Two Winners were crowned: Al Moore with a score of 1199-98X in the F-Class Category and Dan Altman with a score of 1184-61X for the Sling Shooters. This is the end of the indoor shooting until November. Watch this site for information about the 2019-2020 Snow Country English Match Series. We should be posting the schedule in October. Today was an exciting day at Monroe. Well, sort of. We had eight (8) shooters, and Muskegon had four (4). So we are getting into the swing of this winter league. Except for relatively no snow. It's early, yet. I'm sure Michigan will provide an opportunity to use my snow shoes this winter, eventually. This explains why I'm having an IPA while I do the results. Fudge! The next matches are: January 26 - Howell, February 9 - Muskegon, February 16 - Monroe. Still time to get in your four (4) matches to qualify for the Shoot-Off. 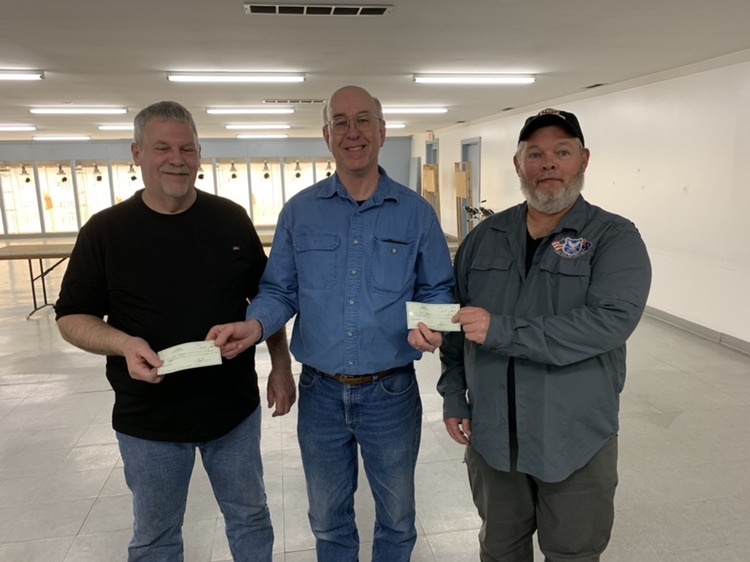 The 2019 Schedule for outdoor Mid-Range Prone and Fullbore Prone matches at the Midland County Sportsman's Club has been posted under "Events" on this site. 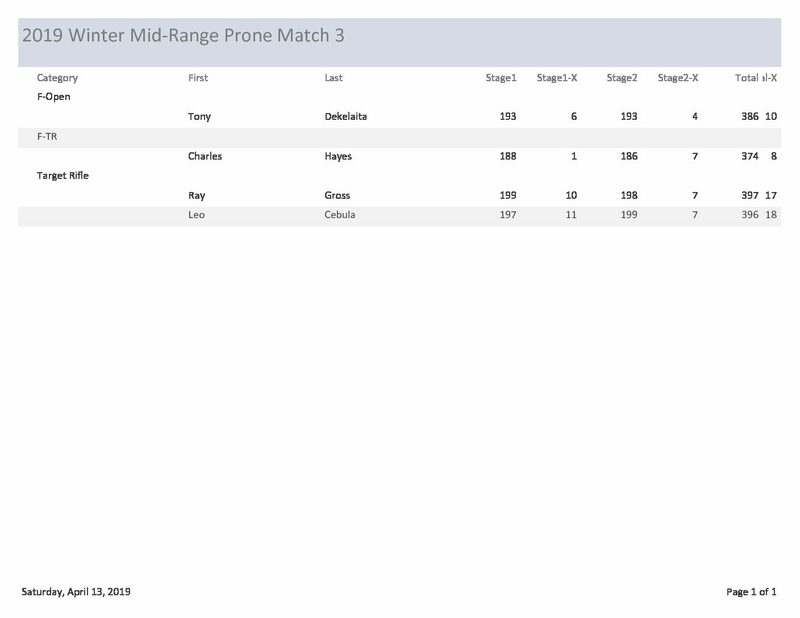 Every Saturday in March and April are potential dates for the Winter Mid-Range Prone League. These are 2x600's, for F-Class and Sling. They run dependent on weather. May 25 Michigan Fullbore Championship (300, 500, 600, F-Class and Sling) Enter at http://www.michrpa.org. We haven't posted anything for a New Year's Eve Match, but there is still time! 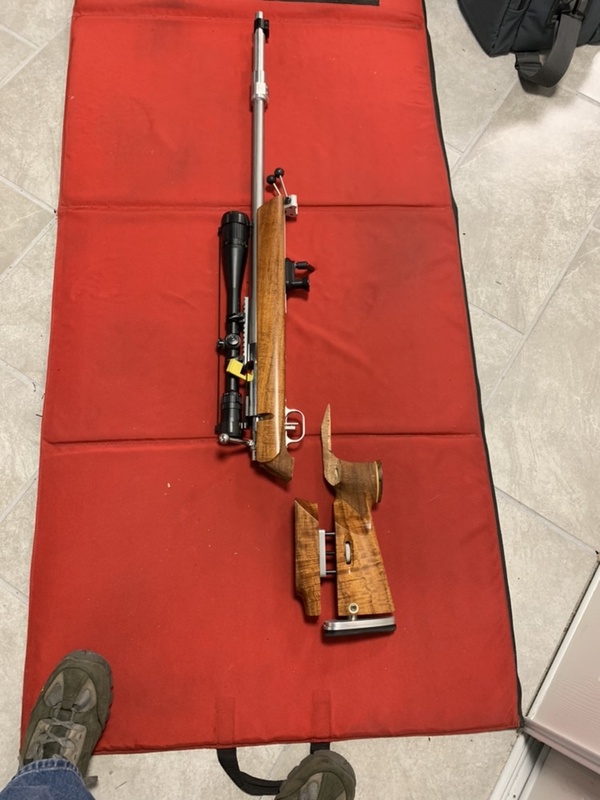 On December 31, 2018 eight (8) shooters made it to the Midland Sportman's Club for the annual New Year's Eve Rifle Match. Unlike last year where the starting temperature was -5 F, this year we had relatively pleasant temperatures in the low 30's, and inside the tent it was probably approaching 50 F (nearby the heater, of course). High Sling Shooter was Ray Gross with a 397-21X. High F-TR was Tom Fisher with a 398-23X. High F-Open shooter was Tony Dekelaita with a 397-21X (I suppose we could be caty and mention that he was the only F-Open shooter, too). That was our last match of 2018 (there wasn't anything left of the year). We will likely begin the Winter league in March. The program and dates are available here: 2019 Winter Mid-Range Prone League Program. If the weather is "frightful" you may want to consider the Snow Country English Match Series: 2018 Snow Country English Match Series.